granulator is operator friendly, easy to service and easy to maintain. Precision scissor cutting action provides maximum through-put efficiency. Combination Hopper for Manual or Robotic Feed. Hinged Hopper for Easy Cleaning and Servicing. Special Steel Plate/Steel Laminate Construction to Reduce Resonate Noise. Oversized, outboard mounted bearings are self-aligning. The bearings are separate from the cutting chamber to eliminate heat build-up and grease contamination. Three rotor knives and two bed knives are constructed of D2 High Carbon Steel. The rotor knives are mounted at a steep angle and counter angled for a precision cut. 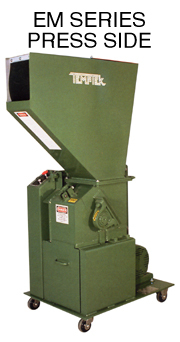 The granulator screen is reversible and provides easy handling of material, as well as vacuum unloading with wand. The screen cradle is hinged and drops open for easy servicing and cleaning. CHAMBER OPENING 8" x 8 " 10" x 10" 12" x 16" 14" x 20"
DIMENSIONS DEPTH (base) 30" 31" 44" 55"
HEIGHT (to infeed tray) 48" 53" 58" 59"
HEIGHT (to robotic feed) 58" 65" 72" 75"
WIDTH 20-1/2" 23" 32" 36"
DEPTH 39" 40" 52" 75"
1 Full Load Amps are higher than run load amps and must be used for sizing disconnects and supply wiring.